In the Currency Strength table, the EUR was the strongest currency while the NZD was the weakest. There were some significant changes last week with the JPY gaining 3 points and the CHF gaining 2 points and the CAD losing 3 points. The other currencies remained around the same level of last week with a maximum change in the strength of just 1 point. The JPY showed a good performance during the whole week and a very strong performance at the end of the week. The EUR and GBP showed a steady and strong performance during the whole week and to a lesser extent, the USD and CHF did too.The EUR is a Strong currency and fits exactly with the current performance in the Classification and Score. The GBP and USD are Neutral currencies and do not fit exactly with the current performance in the Classification and Score. However, being a Neutral currency it may offer some good opportunities against the Weak currencies. The NZD and AUD showed a poor performance during the whole week and a very weak performance at the end of the week. 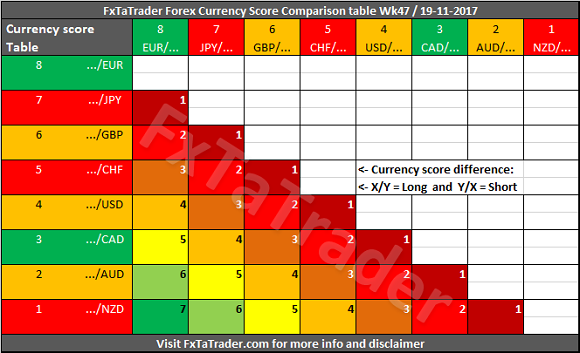 The CAD showed a weak performance during the whole week.The NZD is a Weak currency and fits exactly with the current performance in the Classification and Score. Based on the development as described above it seems that going long with the EUR, GBP or USD against the NZD or AUD may offer good opportunities. If this is being confirmed by the analysis in both of my Weekly articles and the charts are looking in the right direction, these combinations may offer good opportunities. This week we take a look at the Weak currencies. We can see that the JPY is making higher tops and bottoms during the last period after the bottom in September. 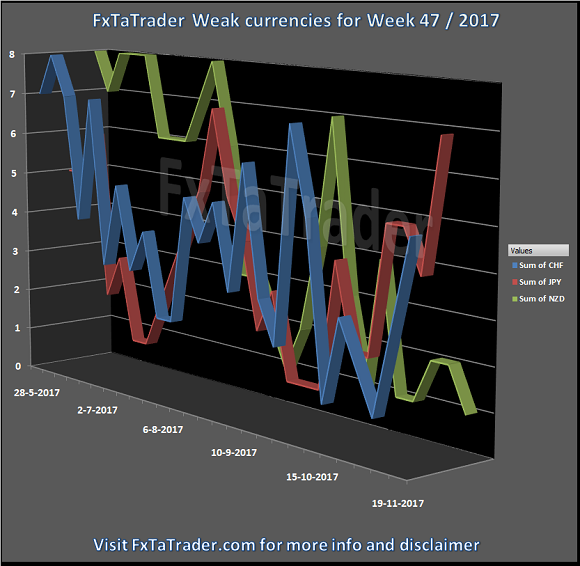 Although it is still too far with the classification from the Neutral currencies it may become one if it remains performing like last week. The CHF is a currency that can be found often in the middle of the range. It is at the moment the strongest currency among the Weak currencies and for that reason the most near to the Neutral currencies. It had a Score of 5 last week which is a Score in the middle of the range. Also, this currency may become Neutral if it keeps showing these Scores. 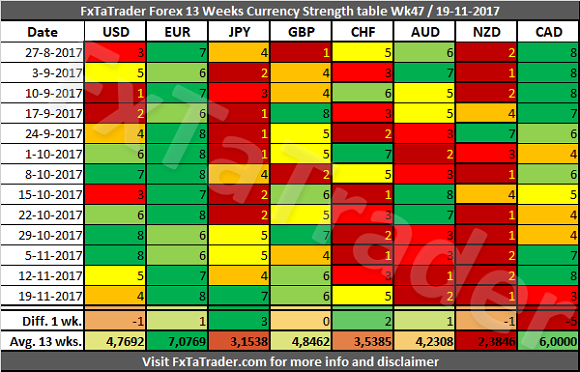 The NZD was the weakest currency of last week and is the Weakest currency according to the Average 13 wks. calculation. There is no sign of recovery there.